The THEMIS ground-based All-Sky Imager (ASI) array observes the white light aurora over the North American continent from Canada to Alaska. The ASI array consists of 20 cameras covering a large section of the auroral oval with one-kilometer resolution. 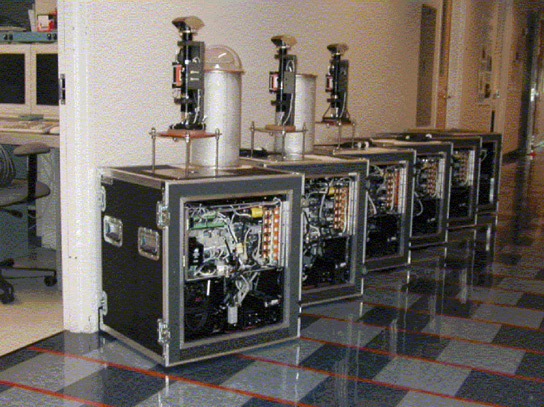 The all-sky imagers are time synchronized and have an image repitition rate of three seconds. During northern winter, continuous coverage is available from about 00:00-15:00 UT covering approximately 17-07 MLT for each individual site. Geographic locations and more details are available here, and an interactive map is available here. Thumbnail images are transmitted in almost real-time from the sites and corresponding overview plots and CDF-data-files are available about two days following data collection. The full-resolution 256x256 pixel images are transferred via hard-disk swap and become available approximately 3-5 months after data collection.